Join the fun and games during the Easter school holidays with our program of activities. Are you a swash-buckling pirate or an adventurous explorer? 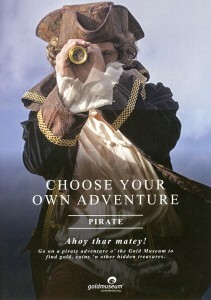 Choose your own self-guided walk of the Gold Museum and discover the hidden treasures within! Available all day. Colour and send a postcard to your family and friends. Available all day. Take a guided tour of the Gold Museum and hear the fascinating stories behind our collection objects. Available at 4.30pm. More information here about ticket prices and opening times. Program offered as part of Sovereign Hill’s The Story Lives On program. Leave a reply on "Choose Your Own Adventure"